Powerful, durable, user-friendly and precision accuracy are amongst the interesting features of the new SLR camera mount recently released by GigaPan. The new model, Epic Pro roboti camera mount is a new photography aid designed especially for professional photographers who need to capture ultra high resolution images. Weighing less than 8lbs, the magnesium chassis design camera mount is able to hold up a DSLR plus lens combo up to 10 pounds with the aluminum arm. 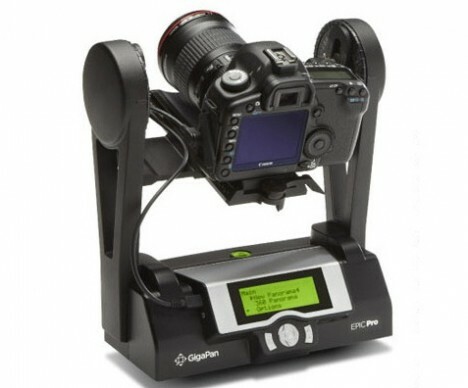 Professional photographers who are required to take high resolution shots with their cameras can get the GigaPan Epic Pro photo system to hold their DSLR and lens properly. Besides support, this photographer aid can also move the camera to capture hundreds or even thousands of photos of a particular scene and stitch them together into a seamless panorama via the new GigaPan Stitch software. GigaPan Epic Pro is compatible with most DSLR models and shapes. It is easy to set up and fits in standard tripods, with ¼” or 3/8” thread. It offers multiple triggering options which allow users to take multiple photos at each image location up to 20 times per position. Users can remotely control and take a panorama from a different location via the remote trigger switch. GigaPan Epic Pro also allows users to do some setting adjustments such as time between exposures, motor speed, aspect ration and picture overlap. The GigaPan Epic Pro camera mount and the 7.2V, 4300mAH rechargeable battery are priced at $895.